Your wish list for a new shed is pretty simple: durable, fairly-priced, and stylish. But shed style — like anything else — is subjective. Finding the shed design you love, and that matches your home, is all part of the fun. At Glick Woodworks, we’ve been building and installing garden sheds for decades. We can show you the most popular shed styles for Central PA — and help you find the one that’s perfect for your needs and your budget. When you buy an authentic, Amish quality shed, you can count on its weatherproof dependability and its long lifespan. Since style is a matter of personal taste, we’ll show you some of the most popular shed styles and help you find the one you like. We describe the A-frame shed style as simple, but never plain. In many ways, the A-frame look matches the lines and look of a modern colonial home — which makes it the perfect backyard accessory. In addition to being one of the best-looking sheds we build, the A-frame shed design packs tons of style and advantages — all for a budget-friendly price. Learn more about matching your shed to your home. The no-frills high wall barn style would look just as perfect on a farmer’s back 40 acres as it would in your backyard. We often describe this shed style as the alternative for homeowners who prefer a more rugged, agricultural-looking shed. In addition to the stripped down design, the high wall barn is practical since the taller walls pack extra storage space in the same compact footprint. The elegant looks disguise the rugged, weather-resistant quality of every Glick shed. With a range of shutter colors and ornate patterned doors, these statement Victorian sheds are the first choice among the HGTV crowd. Victorian sheds are a fantastic choice for both style and storage. While the dormer adds another aesthetic touch, the standard set of double doors make it easy to store your riding mower. The Victorian may come at a slightly higher price point than the A-frame, but many homeowners agree that the distinct style makes it 100% worth it. Learn more about sheds for riding mowers. Don’t see a shed design that’s perfect for you yet? Let us build you something totally custom. 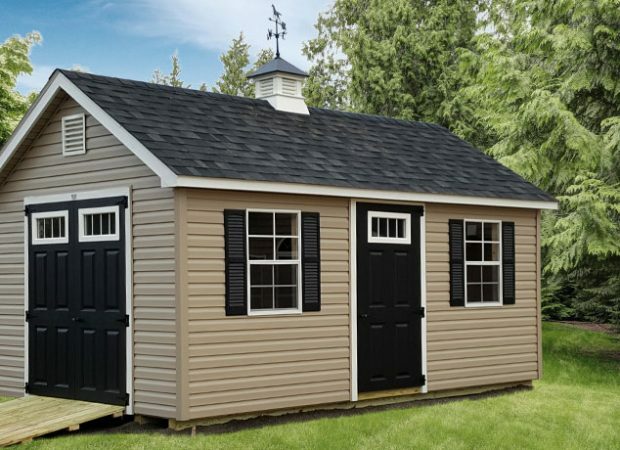 Not only do we allow you to pick your trim and siding colors, but you can plan your custom shed from top-to-bottom, including the floor plan, the size, and the extras like cupolas and gable vents. We start every custom shed project by having a conversation with you to define your needs and the design ideas that inspire you. See all of our shed options. Whatever shed style and design you like, we can bring it to your backyard. More important than the look, though, is your shed’s performance. When you buy a structure built by the true Amish craftsmen of Glick Woodworks, you guarantee the quality that will last for decades. 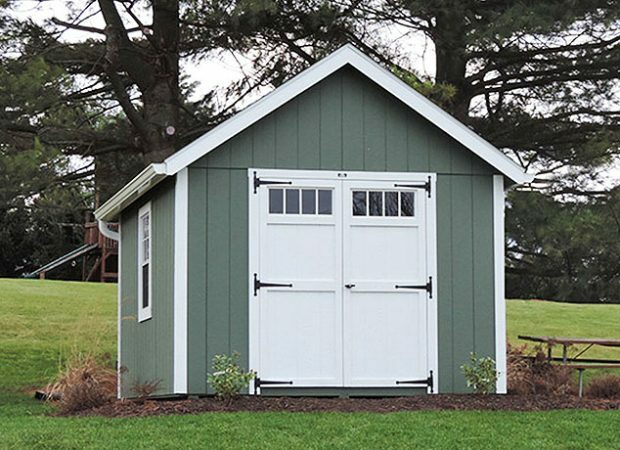 Read our shed quality comparison to learn more about Amish quality vs hardware stores. At Glick Woodworks, we don’t just build our signature sheds, we also craft a wide range of modular garages. 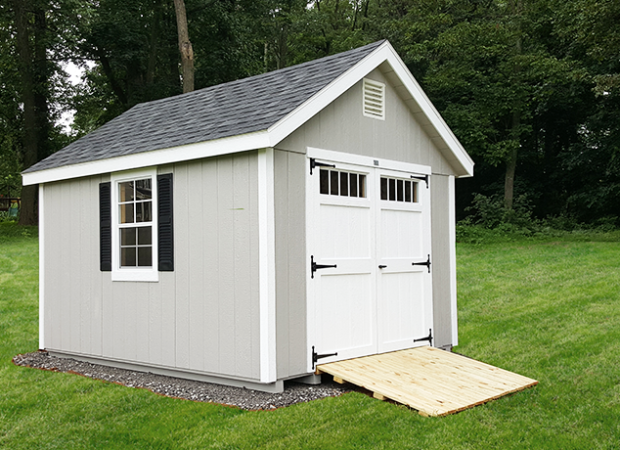 While generally homeowners are far more interested in fine-tuning the look of their sheds, you have plenty of options for your garage style as well. Our A-frame garage is our most popular style garage — and it isn’t hard to see why. These modular garages have an attractive, classic look backed by their convenience and budget-friendly price tag. These garages are the perfect size for storing a vehicle — and providing all of your much-needed storage space. See all of our garage options. Glick Woodworks has earned our reputation as a top Amish shed builder by providing three things: the weatherproof quality you need, the standout shed styles you crave, and the convenience of delivering your shed to you. Whether you want an A-frame, a high wall barn, a Victorian, or something else — we’ll deliver it. By delivering your new shed and removing your old one at the same time, we make it even easier to get the storage you need. Your first step is to start the conversation about the right shed for your backyard and your budget. Contact us today! Contact Us for a Free Shed Quote! "Our overall experience with Glick was very good. We ordered our shed during a busy season but they were able to get it built and delivered quicker then they estimated. And prices were cheaper than all shed places in the area. The free delivery was also a nice thing."